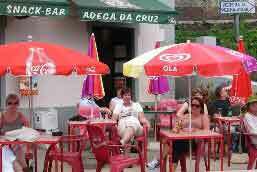 We booked a package holiday with Thomson, staying at Hotel Girassol, about 2km from the harbour at Funchal, Madeira. 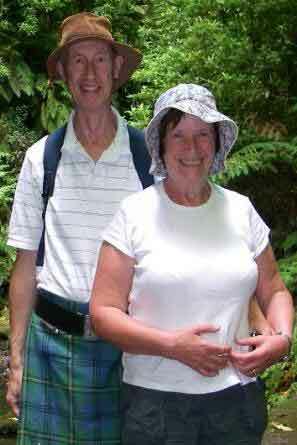 That got us to the island and provided the basis for our Madeira levada walking holiday. 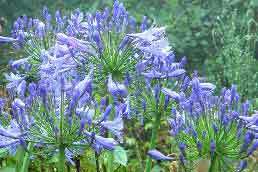 For the walks we read up about many alternative Levada walks on the internet and picked Madeira Seekers to organise our walks. 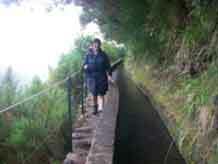 We asked them to arrange five levada walks, easy or moderate and avoiding the more difficult ones. The weather was warm, but it rained the first two days walking, was cloudy on the next two day walks and we finally has some sun on the last day. We still enjoyed it! Steep slopes, but levadas thread their way along the contours under the cover of the tropical rain forest. Waterfalls abound during wet weather. so that it is not so scary. First day: Sat 27 June 2009: Riscio and "25 fountains" levadas in the Rabacal area, unspoiled remote valley covered with tropical forest. 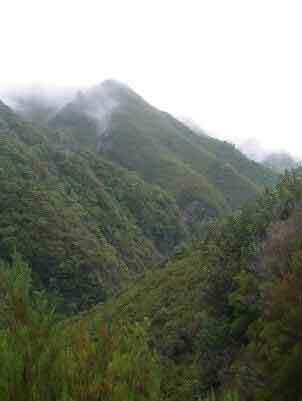 This walk involved gently downhill initially along a road followed by walk along the higher Levada to the Riscio waterfall. We returned the same way, then dropped down a few hundred feet (800 steps) to a lower level levada that led along to its source at the large waterfall with 24 smaller waterfalls nearby. The weather was cloudy with rain at times so no significant views to see. We were distinctly damp while sitting on the rocks around the waterfalls while having lunch. For lunch we had a packed lunch of filled rolls, tomatoes and hard boiled eggs prepared by the hotel which included unusually folded papers each with a tablespoons worth of pepper and salt. Nice touch. After lunch we went back the full length of the levada and ended at Calheta via a 600m tunnel with a big pipe inside. The roof was high and I had no problems, there was also a good breeze so I was not frightened of toxic volcanic gasses. Our min-maglite torches came in handy as it was pitch dark most of the way. 11km, 4 hours, Grade 2 Moderate. 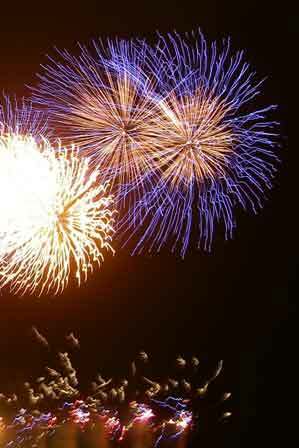 During June Madeira hosts an international firework competition. Each Saturday in June, one country has 30 minutes to give a pyrotechnic fireworks display in Funchal Harbour. Some of the of most impressive fireworks display. I believe that Germany, won with a repeat performance due 31st Dec .2009. 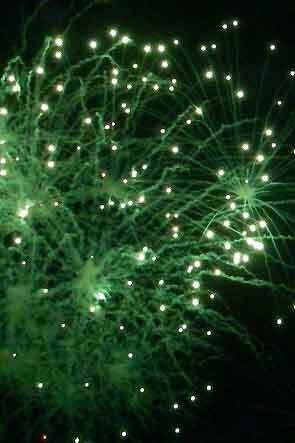 We viewed the fireworks display from a cliff overlooking the harbour. Fireworks at Funcal: We were lucky to be able to go to one of the four fireworks competitions held in Funchal in June. Tonight was the Portuguese entry and the harbour area had been restricted so that the fireworks could be set off along the outer harbour wall. After supper we walked along to the park overlooking Funchal harbour and found ourselves a good viewpoint at the top of a cliff overlooking the port. The fireworks started at 10:30pm and ended at 11pm. The rain kept off during the show but started again for the 2km walk back to out hotel. Day 2: Sunday. Quinta Grande levada walk: Even more rain today and soaked after first hour; not sure if from the inside or from outside as quite warm despite the rain. Rather muddy underfoot. 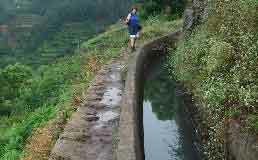 Route was along "Levada do Norte" and past cultivated terraces and small houses with terracotta tiled roofs. We noted the home of the levada chief whose job it was to look after the levada and also to open irrigation sluices according to a strict paid-for schedule as to who should have water at what times of day and for how long. 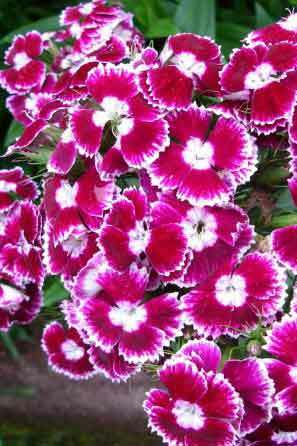 Beautiful flowers in gardens and all their lovely vegetables! 9km, 2.5 hours, Grade: Easy. Day 3: Monday: Day off from organized walking. 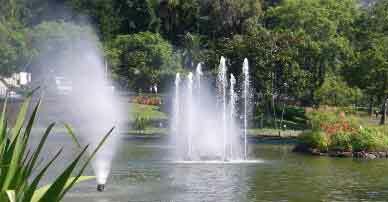 We went down into Funchal, through the park and past the lake with fountains, to look at the harbour and expensive looking sailing and motor boats. Noted the pictures and words painted on the harbour wall by all the passing yachts doing round the world and transatlantic trips. Had lunch by the harbour. 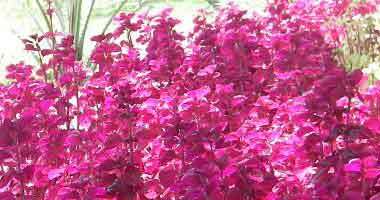 Exotic Madeira flower. 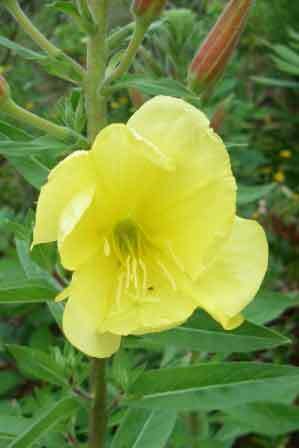 Evening Primrose ? Luxury Duck House, next to water storage pond at end of Levada. Day 4: Tuesday: Queimadas walk: Initially along a broad path suitable for anyone (including the disabled) through the Laurel tropical rain forest. Green and more green in every direction, including upwards! Further along, the path became narrow alongside the levada but no problems with vertigo as there were fences or vegetation along the possibly scary sections. Unfortunately we had to turn round just before the several tunnels and view into the next valley due to rockfalls. Dry today and not too warm. Returned a little earlier than expected. 13km, 4.5 hours, Moderate. Chris and I on one of our walks. 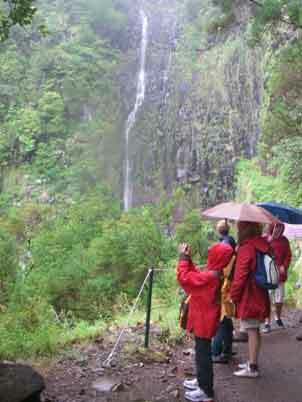 During rain, a waterfall came down on people walking along the levada. 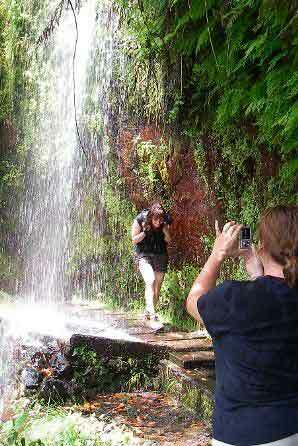 Day 5: Referta levada walk. In the north east of the island past villages with cultivated terraces and houses. Many of these people used to rely on local boats to get to market until the coming of the new roads and tunnels. 7km, 2.5 hours, Easy. 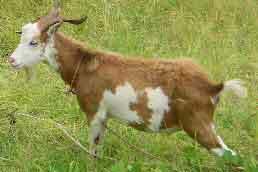 Goat in steep field by Levada. 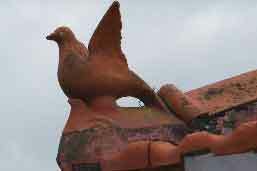 Terracotta bird tile at corner of roof. Before and after each walk we stopped at a Cafe for refreshments and chat. Day 6: Kings Levada: Our final day and a full day walk. 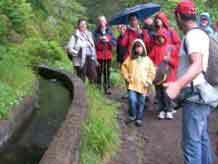 We started at the lower end of the levada where the water was being processed and stored for drinking water. 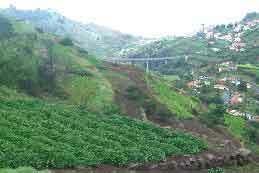 Along the route, the water was being used for irrigation of the many cultivated terraces along the steep slopes. This was by far the best day, the weather was perfect with varied and good views of the mountain tops, the inland valley slopes, the rain forest and the coastal views to the sea. The guide, Anita, was also exceptionally good and pointed out lots of interesting and colourful plants telling us the English names as well, where appropriate. Lunch was at the levada source waterfall where we enjoyed a nice picnic lunch in the warm and dry, for a change!